"I think it pisses God off if you walk by the color purple in a field and don't notice it," says writer/poet Alice Walker -- and there is no denying that the hue grabs all eyes in the garden. If your garden plan includes purple hydrangeas, buy the right kind and prepare to get your hands dirty. Bigleaf hydrangea colors depend on the acidity of the soil. Don't just close your eyes and grab a plant in the garden store. With 23 species of hydrangea available commercially, you'll want to look for bigleaf (Hydrangea macrophylla) and, as the most popular species, it shouldn't be hard to find. It's the only type of hydrangea that changes colors without use of a magic wand. You can manipulate the color of almost any bigleaf hydrangea plant by adjusting the acidity of the soil, so choose something you like. Pick the mophead variety if you want its pom-pom flowers, or a lacecap cultivar for a disk-shaped blossom with frilly petals around the edges. Both thrive in U.S. Department of Agriculture plant hardiness zones 5 through 9. Watch out for white cultivars and a few pink ones that do not change color no matter what you do to them. 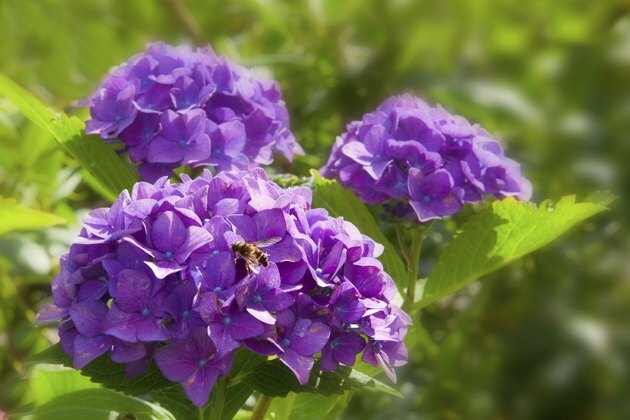 You'll see most bigleaf hydrangeas in "baby" colors -- blue or pink -- but careful adjustment of the soil can result in purple hues. The aluminum in the soil produces the blue shade, but don't go adding aluminum. Most soil contains plenty, but it's not available to the plant unless the soil acidity is high. Soil acidity is measured on a pH scale -- the lower, the more acidic. Generally, bigleaf flowers are blue when grown in soil with a pH of 5.5 or less, pink in soil with a pH of 6.5 or higher, and a mix of blue and pink in the no-man's-land in between. Growing bigleafs in soil with a pH of 5.5 to 6.5 may produce purple flowers, or it may result in flowers with both pink and blue blossoms. Test your soil pH first, to get a starting point, using a simple pH tester kit you can buy at the garden store. If your soil is 5.5 or below, you'll need to add lime to raise the pH to above 5.5. If it is above 6.5, add aluminum sulfate to lower it. Act early; soil amendments can take time to work their magic. The amounts of lime or aluminum sulfate you should add will depend on your current soil pH. To lower pH by one full point, add .2 pounds of sulfur or 1.2 pounds of aluminum sulphate per 10 square feet. Work it well into the soil. To raise pH by one full point, add .2 to .35 pounds of lime per 100 square feet, using the smaller amount for sandy soil, the higher for clay soil.